The city of Samara has a rich history when it comes to expeditions into unknown territory. Yuri Gagarin's transport for the maiden journey into space in 1961 was a rocket that was manufactured here. There's a monument to commemorate it in the town centre. For the fans of England, Samara will be remembered as just another stop on their way to an unexpected destination. They are now starting to wonder where it will end. We all are. As they celebrated their victory on the pitch in front of the small but noisy band of fans that have travelled to Russia, John Stones and Kyle Walker mimicked an old Italia 90 disco-dancing celebration from Terry Butcher and Chris Waddle that featured in a pre-tournament documentary about the last time England genuinely went close to World Cup glory. Up in the stands, Waddle broke down in tears while broadcasting live on BBC Radio 5, overcome by the significance of Gareth Southgate's side moving to within one game of the final. 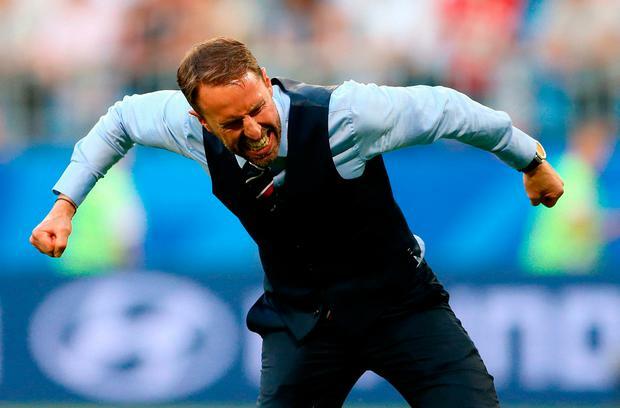 Southgate, embracing his new position as a stately inspirational figure, was stirring up England fans with a clenched fist. For those caught up in the emotion of England's campaign, this was a moment to remember. A release of tension. For the detached neutral, it was slightly different. There was nothing evolutionary about this game. Nothing revolutionary. This game bore no resemblance to Belgium's action-packed win over Brazil on Friday night, an epic showdown that was peppered by moments of quality. In comparison, this drab affair existed in a parallel universe. The short summation is that England scored two headers and Sweden had no response. But it has to be acknowledged that the atmosphere, or lack thereof, played its part in the curious feel around an occasion that really didn't tick any of the boxes for a World Cup quarter-final. You can blame the Germans for that. The world champions assumed they would win their group and advance to the quarter-finals - 10,000 tickets were sold back to FIFA and put up for resale. At short notice, fans of England and Sweden were unable to secure flights to the south-west of Russia, just over 1,000km from Moscow. In their penalty shootout win over Colombia earlier in the week, England were entering the lion's den, tasked with silencing the din of South Americans bellowing their way through every moment. The contrast here was stark. In truth, they were impressive for large spells in Moscow because of how they handled it. The danger they faced here was getting sucked into a trap and switching off against a Sweden side that seemed intent on turning this affair into a non-contest. Previous opponents of Sweden had talked about their efficiency sucking the life out of them. England didn't play especially well; they did not put in a performance that would have encouraged youngsters around the world to take the football and run out into the garden. In truth, they wouldn't be able to replicate it unless they had a parent to loft teasing crosses in their direction. But the fact is that Southgate's side were better than Sweden, just as they were better than Colombia when it really mattered, and that is why they have earned their passage into the latter stages. Fortune has helped them along the way. They haven't met a good team, and have benefited from the unusual results that set up a weak half of the draw, yet all they can do is deal with what's put in front of them. Sweden did manage to test Jordan Pickford eventually but England had a cushion by that point. This was a professional job, at odds with their reputation for struggling against this type of opposition. Remember, their Euro 2016 ended with a whimper at the hands of Iceland. Under Southgate, they have morphed into a much more ruthless operation. Some 45 minutes after the final whistle, the vocal fans were still in the stadium that had long since been vacated by the Russian majority who had embarked on the lengthy trip back into the city to watch their own team in action. 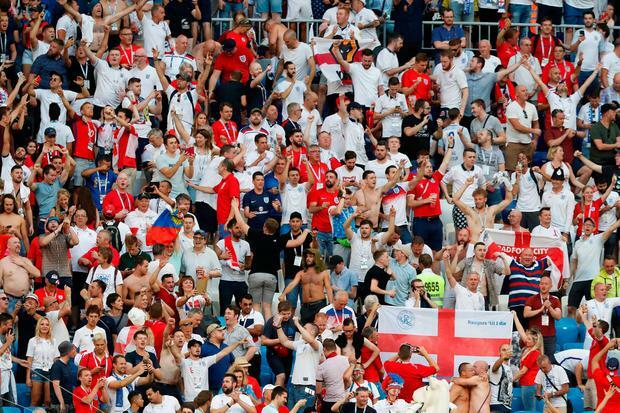 The scarcity of England supporters has been one of the main talking points of the tournament, a clear consequence of scare stories about the hosts' intimidating reputation and the lingering memories of atritional clashes with organised Russian hooligans in Marseille two summers ago. In recent times, England's travelling support have attracted negative coverage arising from anti-IRA chants and a predisposition to that charming ditty about ten German bombers. There has been no such edge around this adventure so far. In a busy restaurant in Samara on Friday evening, the only disturbance caused by an England fan was the act of standing from his seat to perform an ill-timed impression of the Frank Spencer character in Some Mothers Do 'Ave 'Em which blocked the screen showing Brazil's exit. To this point, it's all been very light-hearted, very low-key. It brings to mind Con Houlihan's classic line about missing out on Italia 90 because he was in Italy. There's a completely different World Cup going on back in England to the one that is unfolding in Russia. In these parts, the Three Lions have somehow managed to chug along quietly under the radar, the post-match singsongs their only real exposure to euphoria. Maybe it will all have changed come Moscow on Wednesday. Maybe the easier access will stir the masses and encourage them to chance their arm in search of tickets. Fear has gone, replaced by optimism. With the spirit of Samara, England now believe anything is possible.